This beautiful bronze bird finally has some new life. We received this project as a hand-me-down basket that made it just past the disassembly stage and sat for the past 20+ years. 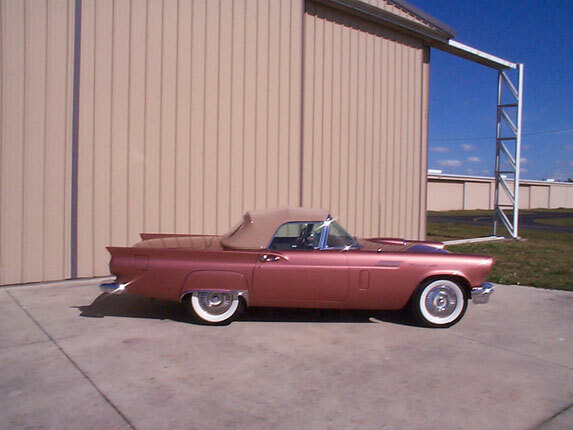 The current owners allowed us to sift through all the boxes of stuff, make some major parts orders and compile the necessary components to make this T-Bird a reliable fun weekend driver. It received a complete stripping and derust to expose the raw truth under its skin. The proper metal, body and paint work followed. The engine (312 ci), transmission, rear end and all accessories got the full overhaul treatment. The frame and all suspension components were powder coated. All hardware was either re-cad plated or replaced. The interior is all new from the seat cushions to the soft top. The charging system was changed from a generator to an alternator and an A.C. system was added to keep the inside cool. The owners are flying high with their new old Bird.